Every single detail of Arden’s community design was meticulously planned with a specific purpose in mind. Our neighborhood streets are strategically contoured so nearly every home backs up to a greenspace or trail instead of another home. Arden Lake stretches a full mile through the center of Arden, splashing splendor over the entire community. And the architectural styles of the homes were carefully chosen to reflect the character and natural beauty of southeast Florida. Learn more about the architectural designs offered at Arden, and see how you can incorporate some of that style into your home décor. Steeped in tradition, the Farmhouse style home is a classic American design that offers a unique array of features. Large, functional front porches, clean lines and often formal dining and living rooms make for a more family-oriented home. At Arden, front porch living is a part of the lifestyle. Embrace it and make your front porch a cozy, inviting place for family and friends. A porch swing, potted plants and twinkling string lights create an inviting space. Interior designs should hint at times gone by, with rustic furniture and accents like tin and vintage nick-knacks. A large dinner table with an X-base design isn’t only trendy, but accommodates big family gatherings and neighborhood get togethers. In the kitchen, wire or wicker baskets are perfect for storing the fresh produce from the Community Farm, just down the road. Check out our Florida Farmhouse Pinterest board for more inspiration. 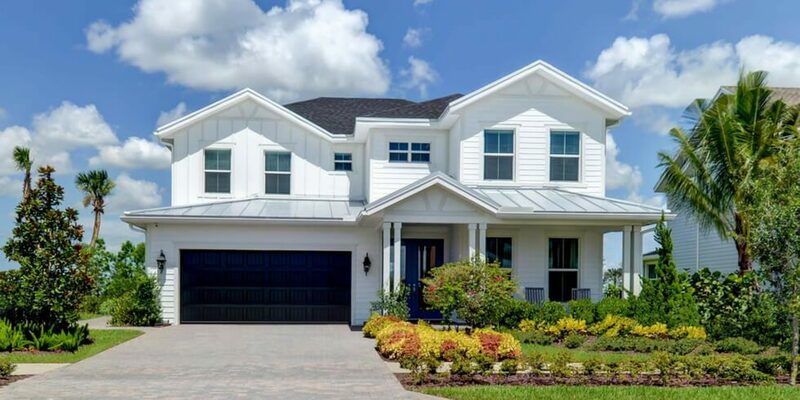 The Florida Craftsman home has a warm, classic design subtly influenced by Florida’s natural landscape, with large overhangs, asymmetrical designs and wall treatments like siding, stucco and shingles. Features with a hand-finished look and rustic textures give these homes an old-world, homey charm. Craftsman-style homes feature strong, clean lines that show off its artsy design. Dark wood furniture, paired with bold tropical prints, make a uniquely Floridian statement. Pops of deep, rich colors in tropical shades of green and pink are a great way to add some flair. Crisp white linens and throw pillows add a refreshing feel and break up striking patterns. Bring a piece of the outdoors in with potted tropical plants that not only add to the atmosphere, but literally breathe fresh air into the space. For more ideas, take a peek at our Florida Craftsman Pinterest board. Coastal Cottage homes offer a combination of steep and shallow roof pitches that allow tons of natural light to come into the home. These homes feature a softer style that calls to the coast, where the sun is king and the beach is not far away. Coastal Cottage-style homes feature a comfortable, relaxed style that’s perfect for spending time with family and friends. Casually decorated with a color palette that includes softer tones like light blues, seafoam greens, whites and beiges hint at the colors of sand and water. Open, airy spaces take advantage of the home’s natural lighting, and a seagrass or sisal rug is a great option for their durability and natural coloring. Proudly displaying the sea glass, coral, shells and starfish your kids have found on trips to the beach is the perfect way to pay homage to the Florida coast. For more décor ideas, check out our Coastal Cottage Pinterest board. Popular in South Florida since the 1920s, Coastal Spanish homes are influenced by the architecture of countries bordering the Mediterranean coast. Comprised of simple, geometric shapes with short overhangs and stucco or brick siding, these homes feature an exotic flair. If you’re a bit more outgoing and adventurous, then you’ll love the bold and eccentric style of a Coastal Spanish home. Geometric patterns and warm color palettes featuring tans and browns with bright pops of reds, oranges and yellows are a trademark of these homes. The bold patterns of Spanish-style tiles, an antique end table in a vibrant color and furniture with ironwork designs are all functional and add the perfect amount of character. Hanging planters overflowing with ivy add interest and bring a bit of the outdoors in. Take a look at our Coastal Spanish Pinterest board for more ideas. Visit our community to find the right home for you, and join our Founders Club to learn more about the Arden’s unique home designs and lifestyle.